Defender® Opening Window Spikes were born from the problem of pigeon proofing a window sill from birds, yet still wanting to be able to open the window. This window ledge spike fixes to the bottom of the actual window frame, so moves with the window when it opens. When the window is shut, the spike sits just above the sill, deterring all birds and pigeons from perching or roosting there. Manufactured from clear plastic, the Defender® Opening Window Spike is inconspicuous when fitted to keep pigeons off window sills. All our plastic pigeon spikes are designed and made by us, Jones and Son in Devon. Please feel free to call in to our warehouse, chat with our friendly advisers and see how our spikes are made. The Defender® Opening Window Spikes come as a pre-assembled unit, complete with the window attaching clips. Each strip of the window ledge spike is 33.4 cm long (13 inches) with an opening window clip at each end. The polycarbonate spike has 4 rows of 5 pins, set at 4 different angles designed to discourage the birds from landing. This fan of pins on the Defender® Opening Window Spikes can easily cover a window sill of up to 30 cm or 12 inches in depth and will keep pigeons off window ledges. Depending on the width of your opening window, 2 or more window ledge spikes may be necessary. Defender® Opening Window Spikes are part of the Defender® range of pigeon control products. The whole range is humane and the bird spikes in particular are recommended by the RSPB as the best solution to pigeon and bird roosting problems. The pins themselves do not harm the birds. They simply act as a barrier and discourage the pigeons from landing on the window ledges and window sills by making it uncomfortable for them. There are 2 opening window clips attached to each end of the Defender® Opening Window Spikes. These clips have 2 indents on either side, which are for screwing the clips to the bottom of the actual window frame. This is the recommended method as, once correctly installed, the Defender® Opening Window Spikes are then ready to keep pigeons off window sills. Another method is to silicone the clips to the bottom of the window frame. This involves taping the opening window spike into position and supporting the underneath of the pigeon spike to keep it level whilst the adhesive silicone goes off - this should take a maximum of 24 hours. Click here to view Defender® Opening Window Spikes - Installation GuideIt is important to check the suitability of surfaces for use with Defender® Silicone. For more information, please visit the product page Defender® Fixing Silicone Adhesive Glue. Defender® Opening Window Spikes are produced from a high quality plastic that is UV stabilised. 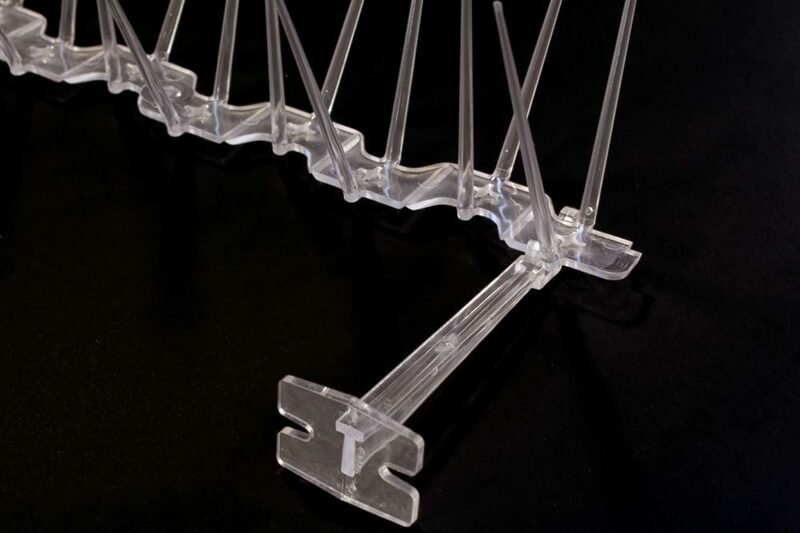 As the opening window spikes are likely to be in direct sunlight, the use of this tough plastic means they will not discolour or become brittle. With this in mind, they come with a 15-Year Warranty. We recommend screwing the Defender® Opening Window Spikes to the window frame as it makes them easier to remove should the window frames require repainting or maintenance. Once any work is complete, the same Defender® Opening Window Spikes can just be screwed back into position without the need to repurchase the pigeon control product. Not every window is the same size, so the Defender® Opening Window Spikes may need to be resized to fit a particular window. The clips are pre-assembled when you buy the Defender® Opening Window Spikes. However, they can be carefully unclipped and repositioned along the base of the bird spike. The base of the bird spike itself has snappable grooves along it, so it can be made smaller to finish a run at the end of an opening window ledge or window sill. Defender® Opening Window Spikes are constructed entirely of Durolon. This is a tough polycarbonate plastic that is UV stabilised, which means it does not yellow in direct sunlight, nor does it become brittle. It also can withstand extreme temperatures as a result of being positioned outside all year long. Defender® Opening Window Spikes will keep pigeons off window sills for years to come. That’s why they come with a confidence boosting 15-Year Warranty. Defender® Opening Window Spikes are designed and manufactured by Jones and Son Pest Control Supplies Ltd. This family run manufacturing firm is based on Dartmoor, Devon in the UK. Jones and Son take pride from the fact that all their Defender® Pigeon and Bird Products are British made from high quality materials. That's why they can confidently offer warranties on all the Defender® range of bird control products, including the Defender® Opening Window Spikes. Our Defender® Opening Window Spikes have solved the problem of how to proof opening window ledges from birds and pigeons. They have helped hundreds of people keep pigeons off window sills whilst still being able to open the window on a sunny day. Visit our Window Spikes Reviews Page.